** PRICE REDUCED!! 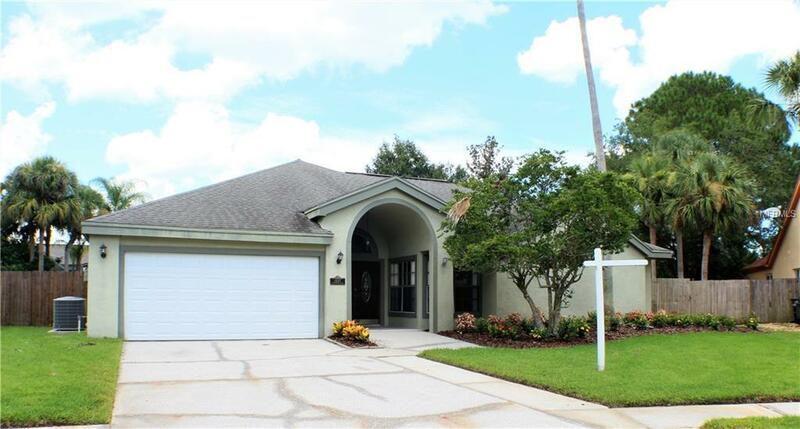 ** UPDATED 4 bedroom, 3.5 bath POOL home in CARROLLWOOD on OVER-SIZED LOT on a quiet cul-de-sac! The freshly stained HARDWOOD floors greet you through the double, lead glass front doors. The formal living room and dining room spaces are flooded with natural light offering views of the pool. The bright family room features VOLUME CEILINGS, a WOOD BURNING FIREPLACE, French doors out to the pool area and is open to the kitchen and breakfast nook areas. The kitchen is complete w/ LOADS OF CABINETS, GRANITE countertops, TILE BACKSPLASH and NEW TILE FLOORS! The master suite is tucked away in the front part of the home w/ access to the pool patio, WALK-IN CLOSET w/BUILT-IN SHELVING, TWO separate VANITIES, WALK-IN SHOWER, separate tub and also has access to bedroom 2. Bedroom 2 features a FULL BATHROOM w/ UPDATED VANITY, mirror & tile floors! Bedrooms 3 & 4 are just off of the family room area and split with the shared 3RD FULL BATHROOM. The 3rd bathroom also has an UPDATED VANITY, mirror and floors. The INDOOR LAUNDRY ROOM has cabinets for extra storage & updated countertop w/ NEW SINK. The pool patio provides plenty of covered space to relax in the shade and open space to soak up the sun. Entertain w/ the pass through window from the kitchen to the outdoor GRANITE bar top! There is a convenient HALF POOL BATH which has been completely UPDATED w/ NEW VANITY, mirror & tile floors. The FENCED backyard offers plenty of privacy & space to run & play. Your new home is waiting!! Listing provided courtesy of Re/Max Acr Elite Group, Inc..